An aspiring star or a hobbyist singer, Riyaz is a must have learning companion! Come join the singing revolution! Riyaz comes loaded with everything you will need to learn singing and practice to perfection! Here are some of the key features. Riyaz offers music courses to learn singing from the best of the gurus who thoroughly understand the needs of the student. Each course comes with video lessons that provides the necessary theoretical background, and audio practice exercises which the student can use to improve her/his skills. Riyaz also comes with quizzes to help you assess your understanding of the music theory. Currently we offer singing courses for Hindustani classical music, Carnatic music and Western classical music. When you practice audio exercises, Riyaz provides visualisation of your voice against the reference voice of the guru. This helps you in understanding where you commit mistakes, and learn singing to perfection! Reach out to senior students for feedback! 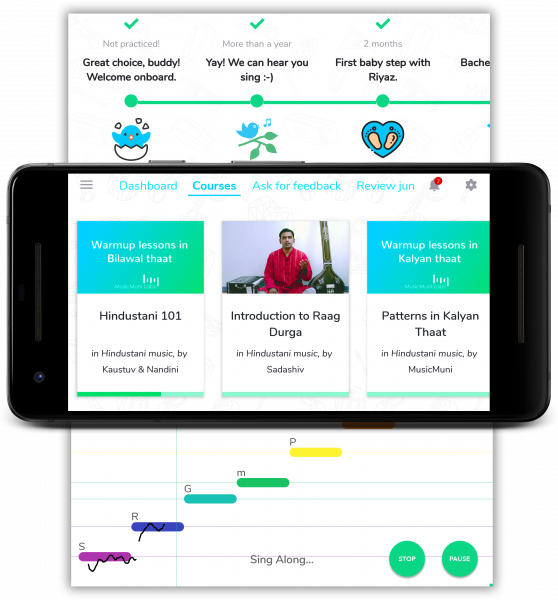 Based on your level in the singing journey, Riyaz provides you a personalised practice plan everyday. You can also improve specific aspects of your voice like steadiness, pitch accuracy, note jumps, vocal agility, range and so on, with practices provided for improving each of them. Track your journey with fun milestones! And of course, you can keep track of your journey with fun milestones that tell you how much you’ve progressed so far. Each milestone marks a major achievement in your journey to learn singing. 750,000+ singers have trusted Riyaz with their aspirations! Come join us today!